Mountain Bird, the lauded fowl-centric spot in Harlem, shut down in June 2014, much to the groans of its growing number of regulars. It reopened in a new location on September 1, 2015, serving up foie gras dumplings in chicken soup, ostrich crostini, chicken gizzard confit and chicken schnitzel. Tastings Social Presents Mountain Bird, 251 E. 110th St., New York, NY 10029, 212-744-4422. Serving American fare with Mediterranean influences, Kat & Theo is headed in the kitchen by a chef who served time at elBulli, Per Se and Momofuku Noodle Bar, as well as a pastry chef who worked at Eleven Madison Park. Kat & Theo, 5 W. 21st St., New York, NY 10010, 212-380-1950. Hailing from Baja California, Señor Frog’s has flicked on its taco-making burners near Times Square. The party-friendly eatery serves up south-of-the-border standards, such as nachos and enchiladas, as well as several variations on the margarita. Señor Frog’s, 11 Times Sq., New York, NY 10036, 212-221-3833. Vaucluse, on the lower part of the Upper East Side, is chef Michael White's foray into French cuisine. The menu focuses on standards and brasserie classics. Décor is neutral in tone and there are two floors for dining. 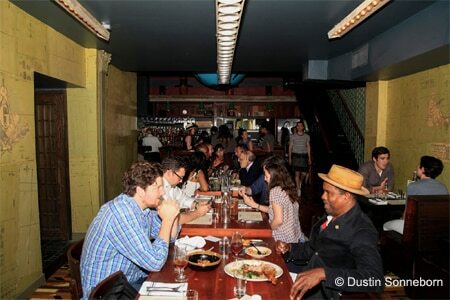 Vaucluse, 100 E. 63rd St., New York, NY 10065, 646-869-2300. The Federal Bar in Brooklyn serves up gastropub fare and local craft beers. It's a concept from Knitting Factory Entertainment, which owns the Knitting Factory music venue next door. Like its Southern California cousins in North Hollywood and Long Beach, The Federal Bar takes vintage cues for its décor. The Federal Bar, 367 Metropolitan Ave., Brooklyn, NY 11211, 347-529-6696. Chef Jonathan Waxman first opened up the California-inspired Jams on New York's East 79th Street in 1984. Despite being a hit, it closed five years later. He's giving it another go in the 1 Hotel Central Park. The menu and décor are different from the original, but Waxman's famed grilled chicken is on the menu. Jams, 1 Hotel Central Park, 1414 Sixth Ave., New York, NY 10019, 212-703-2007. Inday is a new fast-casual Indian eatery. The menu consists of affordable takes on wraps and rice bowls and diners choose among a handful of proteins, vegetables and sauces. Inday, 1133 Broadway, New York, NY 10010, 917-521-5012. The first Big Apple outpost of an international chain called Yakiniku Futago serves up Japanese and Korean-inspired grilled meats. Yakiniku Futago, 37 W. 17th St., New York, NY 10011, 212-620-0225. The new Broken Spoke Rotisserie features a rotating spit crammed with chicken, pork and other meat. The weekly special is called the "Beast of the Week." Broken Spoke Rotisserie, 439 Third Ave., New York, NY 10016, 212-889-6298. Simone Bonelli, former chef of the avant-garde East Village Italian spot Perbacco, is the chef at the new La Pecora Bianca, located in the NoMad neighborhood. The surprisingly affordable Italian restaurant serves up various pasta dishes and a few secondi. The menu emphasizes as many locally made products as possible. La Pecora Bianca, 1133 Broadway, New York, NY 10010, 212-498-9696. Sasha Petraske, the cocktail guru who opened Milk & Honey (and other cocktail bars) and was a major force in the current cocktail craze that's been happening in the last decade, unexpectedly passed away on Friday, August 21, 2015, at his home in Hudson, NY. Rumors were swirling that Keith McNally would reopen his scene-y Pastis in the space that currently houses one-year-old Gansevoort Market in the Meatpacking District. And those rumors are now confirmed: sometime in 2017, Pastis will fire up its Gallic burners at 52 Gansevoort Street. There's no word yet if the Gansevoort Market food hall will relocate or close permanently. Pastis, 52 Gansevoort St., New York, NY 10014, no phone. Holiday Cocktail Lounge, the East Village dive bar that shut down and then was resurrected as a swankier lounge, has just introduced a series of new autumn-inspired cocktails and dishes, some of which incorporate ingredients foraged in the East Village. Holiday Cocktail Lounge, 75 St. Marks Pl., New York, NY 10003, 212-777-9637. Popular Los Angeles restaurant Sushi Zo is coming to New York City. It will be housed in Greenwich Village and should be slicing up sushi for raw fish lovers by December. Sushi Zo, 88 W. 3rd St., New York, NY 10012, no phone. There are three new venders in the Gansevoort Market, the food hall in the Meatpacking District: The Meatball Guys; a Peruvian raw fish spot called Mission Ceviche; and a savory pie place, Myers of Keswick. 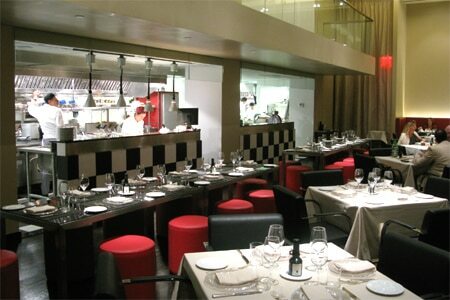 Gansevoort Market, 52 Gansevoort St., New York, NY 10014, 212-242-1701. Chef Floyd Cardoz left White Street at the end of July. He will eventually open an Indian restaurant in New York City, taking him back to the cuisine for which he won much acclaim (when he was at now-closed Tabla). White Street, 221 W. Broadway, New York, NY 10013, 212-944-8378. The Palm, the legendary steakhouse in Midtown East, has shut down. Sadly, the fun, historic murals that lined the walls have been destroyed. The Palm, 837 Second Ave., New York, NY 10017, no phone. Dylan Prime, which served up meat for 14 years in TriBeCa, has shut down permanently. Dylan Prime, 62 Laight St., New York, NY 10013, no phone. Twenty-year-old Josie's, located on the Upper West Side, has closed. Josie's, 300 Amsterdam Ave., New York, NY 10023, no phone. Whitehall, the English gastropub in the West Village, has shut down. An outpost of the restaurant Quality Eats will open up in the space later in 2015. Whitehall's sister restaurant and bar, the Scottish-themed Highlands, remains open around the corner. Whitehall, 19 Greenwich Ave., New York, NY 10014, no phone. Greenwich Village Japanese restaurant Sushi Masamoto has shut down. Sushi Masamoto, 88 W. 3rd St., New York, NY 10012, no phone. Bodhi Tree, a Thai restaurant in the East Village, has shuttered. Bodhi Tree, 58 Third Ave., New York, NY 10003, no phone. Wylie Dufresne's Alder will shut down at the end of August 2015. The chef didn't give a reason for the closure, though we suspect it might have to do with a rent increase. But he has said he will be on the lookout for a new location. Alder, 157 Second Ave., New York, NY 10003, 212-539-1900. SD26 has closed after changing hands from restaurateur and owner Tony May. Before opening San Domenico on Central Park South in 1988, Tony May ran the Rainbow Room for 22 years. SD26 was a collaboration of father Tony and daughter Marisa. Restaurant chef and consultant John Doherty plans to change the concept to focus more on American cuisine. SD26, 19 E. 26th St., New York, NY 10010, no phone.